You see, “The” Ohio State University’s fans are – from an outsider’s perspective… obnoxious, arrogant, and a stranger to reality. Reality: you got off easy, quit whining. They look at the world through one perspective, and one perspective only. 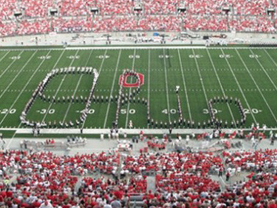 It is the attitude that makes “The” a point of emphasis when people refer to the school as The Ohio State University. Prior to living in Ohio, I spent 13 years in Connecticut where… get this… women’s (and to a lesser degree men’s) college basketball was seen as be all, end all, most infallible, least questioned institution since Newt was asked his opinion on Reagonomics. This is all strange for a native of Indiana, where you grow up in an environment where – gasp – there are two different sides of the coin. You either liked IU or Purdue… and every day you had to coexist with people who had different opinions than you did. You had to coexist, respect someone else’s opinion, and sometimes even (attempt to) have civil discourse. I guess growing up in an environment where a “one size fits all” mentality when it comes to rooting interests is beneficial… and it has nothing to do with sports. In business, in marketing… it is imperative that different voices be welcomed, fostered, and never… never see one solution or one person as “THE” anything. That’s why I always tell my employees that they must feel free to speak their mind. You never know where good ideas may come from – but I’m pretty sure new ideas will be stymied if anything is ever seen as “the” way. Don’t be afraid to be challenged, it doesn’t mean the Buckeyes are any worse for it!